How did life begin? We will never know with certainty what the Earth was like four billion years ago, or the kinds of reactions that led to the emergence of life at that time, but there is another way to pose the question. If we ask “how can life begin?” instead of “how did life begin,” that simple change of verbs offers hope. It does seem possible we can demonstrate a series of obvious steps toward the origin of life, perhaps leading to a synthetic version of life in the laboratory. 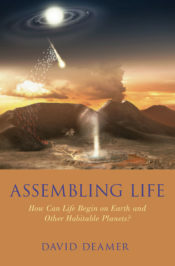 We will then be able to provide a satisfactory answer to the second question: How can life begin on the Earth and other habitable planets? The first step toward life involves a fundamental question we can answer: Where did the elements of life come from? Take a look at the simplified periodic table below. See the six elements in green? Those are called the biogenic elements. Image Credit: Periodic Table by David W. Deamer. Used with permission. If you add up all the atoms composing a living cell, those six represent close to 99% of the elemental composition of proteins, nucleic acids, and cell membranes. Life does need these six elements, but it only works if the elements have combined into molecules. Let’s consider what happens if we put two or more of the elements together in a compound. Carbon and hydrogen, for instance, become hydrocarbons, and the hydrocarbon chains in cell membranes are an essential component of life. If we let three elements combine, such as carbon, hydrogen, and oxygen, we get carbohydrates like sugar and cellulose. Five elements—carbon, hydrogen, oxygen, nitrogen and sulfur—form the amino acids of proteins, and if we exchange phosphorus for sulfur five elements also compose nucleic acids like DNA. Even though we know the ultimate source of biogenic elements, we also need to know how they become compounds, and then how the compounds became sufficiently complex for life to emerge on the sterile Earth four billion years ago. Now we can return to the source of the biogenic elements. With one exception, the biogenic elements in all life on Earth, including elemental silicon and iron (which compose the Earth itself) were synthesized in stars. The exception is hydrogen, and the only reason it is present on Earth as one of the biogenic elements is that the hydrogen in water–H2O–had the good fortune not to be caught up in the sun when our solar system formed. In fact, in terms of numbers of atoms, hydrogen makes up about 70 percent of all the atoms in life on the Earth. How could the elements of life possibly come from stars? In 1946, Fred Hoyle, a young British astronomer, had an idea. Hoyle was full of ideas, and boldly published most of them, but only one has survived experimental and theoretical testing. To understand his idea, we need to recall a little high school chemistry. All matter is composed of atoms, and all atoms have a tiny nucleus composed of particles called protons and neutrons, which are surrounded by orbital clouds of much lighter electrons. But in stars, the temperature is so high that the electrons fall off, so stars like our sun are composed of a gas of naked atomic nuclei, mostly hydrogen and helium. Hydrogen is the lightest element, with a single proton in its nucleus, and helium is the second lightest element, with two protons and two neutrons in its nucleus. When the temperature is high enough, around 10 million degrees, hydrogens combine to form helium and release an enormous amount of energy. This is the energy that make stars shine. Hoyle’s brilliant insight was that a second fusion reaction begins when a star approaches the end of its life and its temperature approaches 100 million degrees. At that point two helium nuclei fuse to form beryllium, the lightest metallic element, which then can fuse with another helium nucleus to produce carbon. Earlier theoretical models had already shown that if carbon is available in a star, nitrogen and oxygen can form in a process called the carbon-nitrogen-oxygen cycle, which is the primary source of fusion energy in large, hot stars on their way to becoming novas and supernovas. Those models did not include a source of carbon, and this is where Hoyle filled in a gap. To sum up, the atoms of carbon, nitrogen, oxygen, sulfur, and phosphorus that comprise all life on the Earth were forged in stars at temperatures hotter than any hydrogen bomb. As living organisms, we are not in any way separate from the rest of the universe. Instead we borrow a tiny fraction of its atoms for a few years and incorporate them into the transient molecular structures of cells that are the living unit of all life on Earth. Featured image credit: “Butterfly Nebula in narrow band of Sulfur, Hydrogen and Oxygen” by Stephan Hamel. CC BY-SA 4.0 via Wikimedia. The author could explain how the two neutrons in helium are created starting from hydrogens with no neutrons in them. Sorry to be so naive and obtuse, but what went Bang! in the Big Bang?